Do I need planning permission for my veranda? No, canopies are unlikely to need planning permission - they fall under the area of "Permitted developments." However in a few special cases planning permission may be needed - we can advise you if fall into this rare group. Can I install my own veranda? Yes you cans! all of our roof kits are supplied complete with everything you need - and all delivered to your door. We prepare every canopy to ensure it is ready to be installed, no cutting or drilling is needed - it is all done for you in advance! How much will my veranda cost? 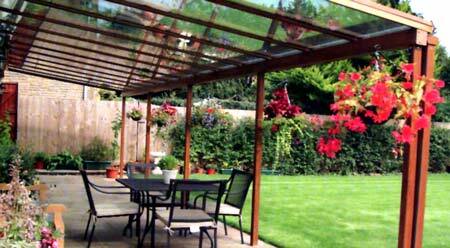 You should be very pleasantly surprised by the cost or your garden canopy. Just measure the width and projection of the area you would like to cover and give us a call on 01494 444666 ! It won't take long for us to get back to you - and it won't take long for us to deliver and install either!